A guest post by Elizabeth Éowyn Nelson. 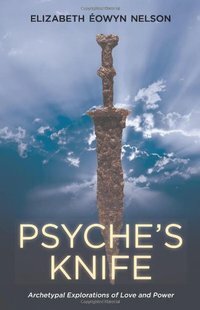 The following is excerpted from her book Psyche's Knife: Archetypal Explorations of Love and Power. Simple things are always the most difficult. At dusk, the silence of the lonely rooms grows thick. A young woman walks down the broad stone corridor, caressing the smooth glass of the oil lamp in her hands. The viscous liquid sloshes lazily from side to side as she enters their room. She knows he won’t arrive for many hours yet, not until it is dark. It has always been this way. With trembling hands, she sets the lamp behind the luxurious bed and gently touches the cold black wick. Then she turns her attention to the knife. “You must grasp the two-edged weapon boldly,” her sisters had told her, “and with a mighty thrust sever the neck from the head. Only then will you, and the child in your womb, be safe.” It couldn’t be true, she thinks. She slowly traces the carved hilt with her fingertip but recoils at touching the blade itself. “Remember the oracle,” they had said. The young woman lifts the knife high. As long as her forearm and as wide as her wrist, it possesses surprising grace for something so heavy. In that moment, wondering who to believe or what to believe, she is afraid of her courage and afraid of her fear. She is certain of only one thing: by tomorrow, it will all be different. As she begins to lower the knife slowly, a last beam of light from the dying day dances along the razor-sharp edge. The young woman realizes it is a living thing, this knife. Knives aren’t terribly ladylike. I suppose that’s why they fascinate. For years, whenever I have spoken to another woman about a large, razor-sharp, double-edged knife in the hands of a woman, the response has often been immediate and dramatic: she sits up straight or leans forward, her eyes glitter or she inhales sharply. In a subtle combination of tiny moves—a settling of the shoulders, a lift and rotation of the neck, a rearrangement in the mus­cles of the jaw, teeth, and lips—she seems to grow more substantial. Her reaction has a distinctive feeling-tone, something creaturely, calling to mind the ready muscularity of a healthy animal. We see it in horses collecting themselves before they leap a fence, in cats who fix their gaze with fearsome stillness, fur rippling with barely contained excitement, and in the alert eye of a great black crow. It is only rarely that this response does not occur, and when it does, there may be a variety of reasons for it. Since I’m frankly fascinated by knives, the women I’ve spoken with may be responding to my fascination rather than their own. Enthusiasm is contagious. Or perhaps knives per se aren’t fascinating, but rather that what captivates is a woman in possession of a volatile, dangerous weapon that really belongs to men. Or so we’ve been told. Elizabeth Éowyn Nelson, PhD has been teaching in Pacifica's Depth Psychotherapy Specialization since its inception in 2006, acting as Research Coordinator during that time. She is Dissertation Policy Director at Pacifica, where her expertise in scholarly writing and research is the foundation for a broad range of courses she offers in research process, methodology, and dissertation development. She also teaches courses in embodied dream work, imagery, and cultural studies, blending her professional experience as a consultant in high technology with an interest in the Gothic to formulate a course on digital life and the cyborg. Dr. Nelson's own research interests include personal and cultural expressions of the shadow, gender, and power, with a particular fascination with how we construct, encounter, and understand evil and the monstrous. She is the author of two books, The Art of Inquiry: A Depth Psychological Perspective (Spring Publications, 2005, coauthored with Joseph Coppin) and Psyche's Knife: Archetypal Explorations of Love and Power (Chiron, 2012). A professional writer and editor for nearly 30 years, she coaches aspiring authors across a variety of genres and styles and has helped doctoral graduates transform their dissertations into mainstream books.